Pocket Cats: Feline Charm by Kitty Wells. 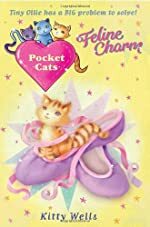 A Pocket Cats Book. Review: Do you like books about animals? Do you like books with magic in them? If you answered ÒYesÓ to those questions and you are in the upper elementary grades, Feline Charm by Kitty Wells is a good book for you. Feline Charm is the story of two best friends, Maddy and Rachel, who love to dance ballet together. However, Rachel wants to quit ballet, so Maddy uses cat power to boost her confidence. Ironically, when the cast for the huge recital is revealed, Rachel finds herself with the lead part. Maddy becomes jealous, and this leads to the dilemma. Will Maddy support Rachel on opening night or not? Will she use cat power? You will have to read the book to find out! In my opinion, Feline Charm is suited for girls in grades three to five. Since I am a sixth grader, I really didn't like the book. Also, I felt that the book moved along too slowly. I would have enjoyed it more if it had a quicker pace. Additionally, the book had a few words in what I think was French; that seemed unnecessary to me. I did enjoy the character development, particularly of Maddy. The book contains twists and turns in Maddy's attitude toward Rachel. In conclusion, I didn't like the book, and perhaps if I were a little younger, I would've found it more interesting. Without a doubt, I recommend Feline Charm for girls eight to ten years old. You will enjoy this book if you are a girl in elementary school who loves cats and animals with special powers! We would like to thank Random House for providing a copy of Pocket Cats: Feline Charm for this review. Have you read Pocket Cats: Feline Charm? How would you rate it?